One great aspect of visiting southern California in winter is that birds are everywhere that there is even marginal habitat. On my trip we stayed in Yorba Linda in northern Orange County, which, you will be unsurprised to learn, is pretty much the archetype of sprawl. * Despite the developed nature of the landscape there were some birds that did very well in the interstices. For example, a horse trail that wound between developments and led me to some scrubby lots, and, eventually, the southern edge of Carbon County Regional Park was absolutely loaded with birds. Even the tiny backyards with citrus trees and ornamentals had hummingbirds, sparrows, and doves. So I spent several mornings of our trip taking a walk for an hour or so before Daisy and Desi awakened and was amazed at some of the birds I found, about which I will eventually write a full post. 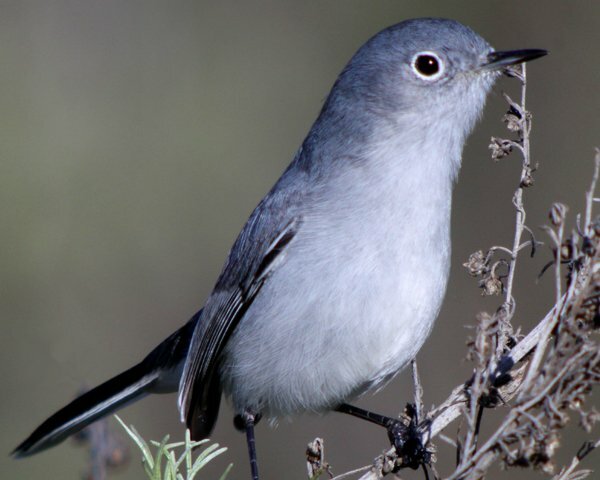 The best bird that I found, however, was, beyond a doubt, a female California Gnatcatcher. 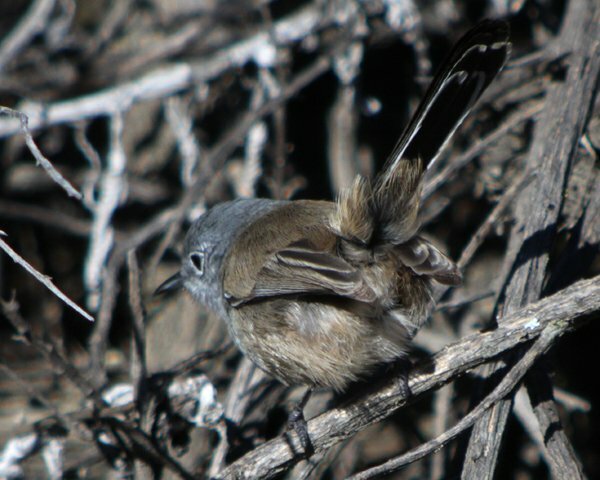 California Gnatcatchers, otherwise known as Polioptila californica, are listed as threatened in the United States because of the population decline that has accompanied the rampant development that has gobbled up so much of their habitat. 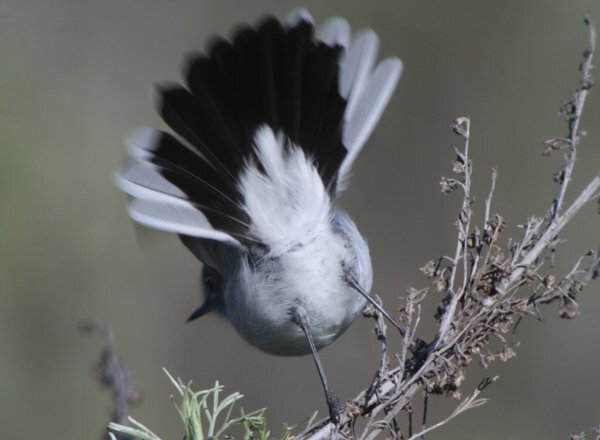 Despite their precarious situation in California, the only state in the United States they occur in, and their negative population trend Bird Life International considers them a Species of Least Concern because of their large range and overall robust population (their range extends into Baja California). The little gnatcatchers inhabit coastal sage scrub year-round and are not a terribly difficult bird to identify, that is, assuming one gets a decent look or hears one calling. 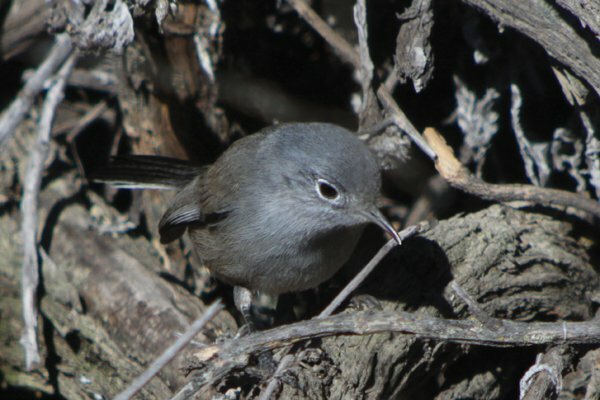 If the bird is being difficult and staying hidden in the brush it can be difficult to differentiate a Polioptila californica from a Polioptila caerulea, better known as a Blue-gray Gnatcatcher, especially in winter when the latter species occurs in large numbers across all suitable habitat in southern California. 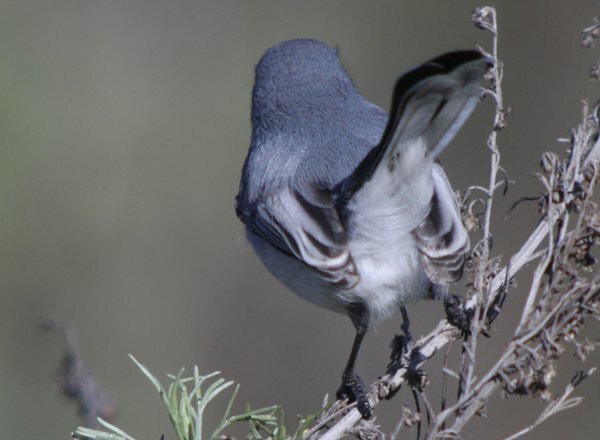 Blue-gray Gnatcatchers have white outer tail feathers, which, when the tail is not fanned out, rest on the bottom of the tail. You can see how prominent the white is in the tail in the picture at right. California Gnatcatchers have very little white on the tail feathers, essentially only on the outer edge of the outer feathers. 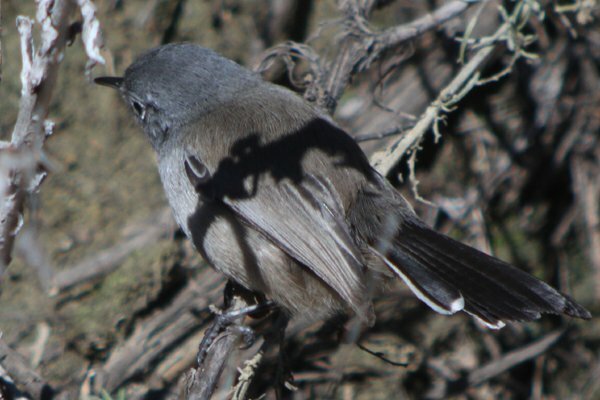 Other field marks, like the brown edges of the tertials of the California Gnatcatcher versus the white edges of the Blue-gray Gnatcatcher‘s tertials or the subtle differences in structure are more difficult to see well or to quantify. Interestingly, every source I checked said that California Gnatcatchers are almost always seen in pairs but the bird I spotted was alone, which made me wonder if it had been displaced by the heavy rains that southern California experienced before I arrived and while I was there. I was certainly pleased by the unexpected opportunity to see and digiscope a California Gnatcatcher in a bit of unlikely habitat and I hope that she finds (or refinds) a mate and manages to make more gnatcatchers. Southern California could use more, that is for sure! *It is also the birthplace of Richard Nixon and every time we passed the sign that guided people to the Richard Nixon Library and Birthplace it made me giggle. **Unlike certain other 10,000 Birds bloggers who will stop at nothing to add a bird to their life list (kidding, just kidding). Cool find. I was actually just checking them out in a field guide because I will be spending the summer on the Arizona/Cali border. @Tim: Good luck with the Black-tailed Gnatcatchers then! Looks like a Western Blue-gray. any news on them being potentially split? sibley hints in this direction in his “large” guide. And regarding the brownish Cal Gantcatcher, I am glad that at least some warbler-like birds in North America live up to our high European colouration standards. Beauuuuutiful bird. we have some that breed each year in under the waterfall in our swimming pool area. this is probably the 4th year and there are currently 2 nests. each year they will hatch between 2-3 batches. we love watching them and seeing how they take turns feeding the young. Acorn Woodpeckers Drinking Sugar Water?